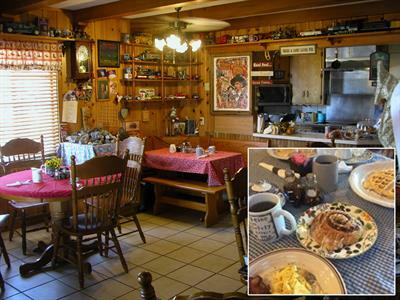 Stampede RV Park is the best Tombstone Arizona RV camping or Bed & Breakfast for the whole family! Come and join us on the third weekend in October for Helldorado Days! Live street entertainment, Gun fight Groups, costume contests, parade, prizes, Saloon girls, lots of fun for all! 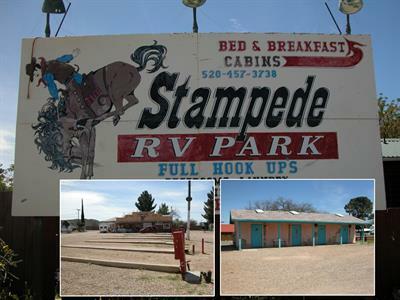 Located in Cochise County of southeast Arizona, within a few miles of the Dragoon Mountains and the San Pedro River, Stampede RV Park is an owner-managed RV park & Bed & Breakfast offering new spacious cabins for 2 to 6 people (sorry, no pets in cabins)& a clean and neat campground for families enjoying camping in Tombstone. Stay in Tombstone for the best accommodations, make it a trip of a lifetime! Stampede RV Park is within walking distance of the famous downtown Tombstone, as well as centrally located to several popular attractions, including gold, silver and copper mines. Whether you stay for a weekend, month, or longer, Stampede RV Park is your ideal home away from home for your Tombstone camping or Bed & Breakfast experience. Best Family Vacation Spots - Discover family vacation ideas at The Vacation Brain. Camping in Tombstone also brings several wonderful events and special holidays throughout the year. Join the locals and visitors alike during the Territorial Days in March, the Rose Festival in April, Wyatt Earp Days in May, and much more! The Helldorado Days in October are not to be missed! That's not all! Tombstone camping & B & B is a great place for a family or group to choose as a camping destination. Our famous town is world renowned for its mining and Earp Brothers history. 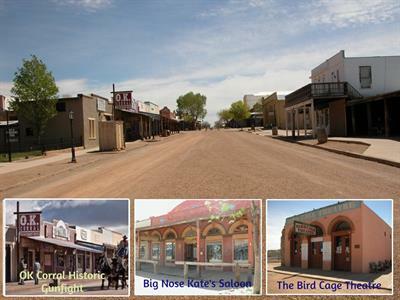 While camping in Tombstone, you will find yourself stepping back into the past as you witness reenactments in the streets or take a stroll along the boardwalks on Allen Street where you'll find Big Nose Kates & the Crystal Palace, both with live entertainment, & the Longhorn restaurant with the best chef in these parts. Don't miss the Boothill Cemetery, Tombstone's final resting place for the good, bad and evil of the 1800's. Stop by Doc Holiday's for a cool drink & right next door, enjoy a historical reenactment gunfight show, visit the world's largest rose tree, tour the town on an old fashioned Trolley Bus & take in a family-style Wild West Show! Stampede RV Park is centrally located within walking distance of all attractions. Stampede RV Park is now offering, along with our new cabin facilities, a "Breakfast Only" restaurant with outdoor patio dining or inside where you can watch the Tombstone movie, open to the public. 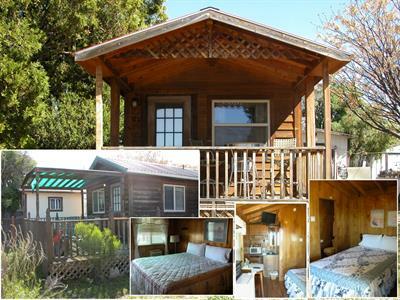 Our cabins (pictured above)have a double bed in the smallest one & king size beds in the other 2. Our "family" cabins are park model mobile homes that have 2 bedrooms each, 1 with 2 full bathrooms & the other with 1 full bathroom. Both have full kitchens & a fold out queen bed.